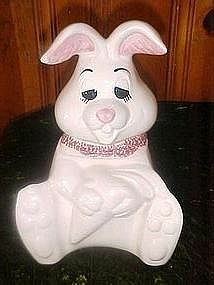 A nice large sitting rabbit cookie jar by Doranne of California. Made of heavy ceramic. Hand painted and glazed. This one wears a pinkish red sponged scarf, but has a chip on one ear, and a few other small minor nicks. Measures 12 1/2" tall. Nice for Easter. We have another identical but in perfect condition with a blue scarf for 45.00.